I have been asked more than once for recommendations on my favorite resources for children with anxiety. Today I thought I’d share a few of my favorites. 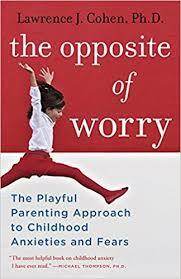 Freeing Your Child From Anxiety by Tamar Chansky. I love this one because Dr Chansky covers such a wide range of disorders and potential challenges. You can find something on almost any type of anxiety, adhd, phobia you can think of. It is not a light read and it took me awhile to get through, but I find myself going back to this one quite often for tips or reminders. 2. Differently Wired: Raising and Exceptional Child in a Conventional World by Deborah Reber. This one was actually a recent find and I first heard about this book on a podcast. I love that Reber has personal experience raising a differently wired child. She is not afraid to think outside the box and I put this one down feeling like she allowed me more freedom in my parenting. There is no one size fits all approach and I loved how she turns exceptional children into a positive. 3. The Opposite of Worry by Lawrence J Cohen. I tend to steer more to the serious side and want proven, actionable strategies. This book opened my eyes to making things more fun for my kids. My oldest deals more with the fears and I found the ideas in this book to be really helpful for getting all of us to reframe things. 4. Understanding Girls with ADHD by Kathleen Nadeau, Ellen Littman and Patricia Quinn. I was kind of taken by surprise with my middle child’s ADHD diagnosis. This book really helped me to see the signs I was missing. There are so many misconceptions that ADHD/ADD is a child bouncing off the walls, not staying on task, being disruptive in class. I needed this book and if you have a daughter dealing with any type of mental health issue, this is a good read. They go into depth on thought processes, emotions and just overall reactions of girls. I also have some resources more specific to Selective Mutism, feel free to email me if you would like those! There are also a few websites that I have found to have amazing resources. 5. Worry Wise Kids - This was actually created by Tamar Chansky (author of Freeing Your Child from Anxiety). She provides a lot of the same information from the book in a more condensed version. But, also links to other resources and access to workshops. Good website for parents. 6. Anxiety and Depression Association of America - This is a non-profit membership site, but you can also find some general information as well as a search option to find therapists and psychiatrists in your local area. 7. Coping Cat Parents - I LOVE this website. There is a section for parents, professionals but also a section FOR KIDS! You can also purchase an online program (I have not done this, so I can’t speak to what it’s like). So much good stuff and I highly recommend browsing around. I spent so much time researching resources and have read more books than I can count. We’ve seen numerous psychiatrists and therapists. Every single one is different. My advice is to keep searching until you find the right fit. There have been several books I’ve just closed after the first chapter, therapists we’ve only met with one time and lots of trial and error at home. In the end, this is YOUR child and you are their advocate. If you don’t feel like something or someone is a good fit - look elsewhere! Don’t be afraid to think outside the box.